Surge here. 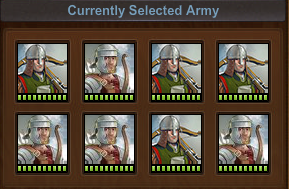 I have seen many people complaining about how the AI randomly chooses whatever units will start first in your army during a battle. I found a solution for this. Please keep in mind that it works ONLY with units of the same speed value but of different tiers, as you would rather have a Trebuchet go first than a Ballista you have yet to replace. Some people may already know this trick, however, others are stuck with it. This is all a very easy process which requires no more than a minute. 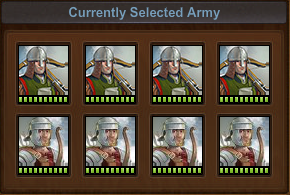 1) First, you have an army like the picture below. I want my Crossbowman to start first so that it’s high damage gets dished out first. 2) Go to your campaign map, and select a province. Select a sector, and click attack. Don’t worry, as 99% of you already know, it will prompt a confirmation with which it allows you to make final minute army set-up. Remove all of your desired units like in the screen shot below. And for proof, here is a screen shot of the battle that ensues after! Notes: It works 80% of the time if you are doing it in the city. The other 20% is the chance the AI will randomize it yet again before you confirm your attack. If you do it while you are in the city, pay attention to the units displayed on the attack confirmation box. This does, however, work 100% of the time if done in the attack confirmation box.